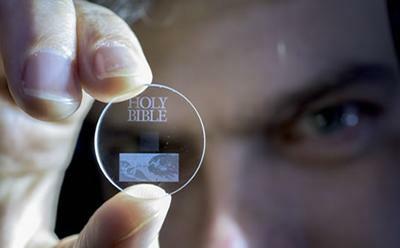 Recently, I came across this article about a new kind of data storage developed by researchers in the UK. Using nano-structured glass, it stores 360 terabytes of info on a small piece of quartz. This information is theoretically stable for 14 billion years. A basic truth to this universe is that everything changes. All composite forms eventually break down, or are transformed into something else. In 100,000 years, it's possible that very little trace of current human culture will still exist. In a million years, it's doubtful that anything we've created would survive. In a billion years, there will almost certainly be nothing left of human existence at all. If this is true, then why do we bother doing anything at all? That is the eternal question, and the only answer is that we do what we are compelled to do. The source of this compulsion is our desire to overcome our fear of impermanence. We do this by trying to make a lasting impression on others and the world. So... I know everything that I'm doing will eventually cease to exist in its present form. However, I still seek to preserve aspects of myself, my life, & my digital data. I am here, experiencing this life, so I do what I feel driven to do! Cosmic perspectives are important, but a fully aware person must dwell in the personal realm, as well. There is a lot of myself and my creative work stored online now. I feel like this is an opportunity to preserve some aspect of my life into the future, more so than people of past eras were able to do. Of course, a global catastrophe could happen anytime that could knock out the global information network & perhaps even our power grid. This could be avoided by getting data storage off-planet, into outer space. Even if we avoid this fate, it is questionable whether anyone would be around in a million (forget a billion) years to experience anything we are doing now. Even if there were, the next question is- Would they even be able to access the information we have left, in a way that is meaningful to them? Perhaps this would be a situation like the mysterious "crystal skulls". They could be a 3D quartz data storage system from a lost civilization, but we have no idea how to access it! Oh well. I guess it's not worth worrying about whether or not anything we do is truly lasting. We just have to make the best of our individual situations, & try to be a positive influence on the consciousness of as many people as possible. The interface between biological and cybernetic systems is becoming more interconnected. I saw an article about a study that was done by Duke University, testing the integration of brain & computers. 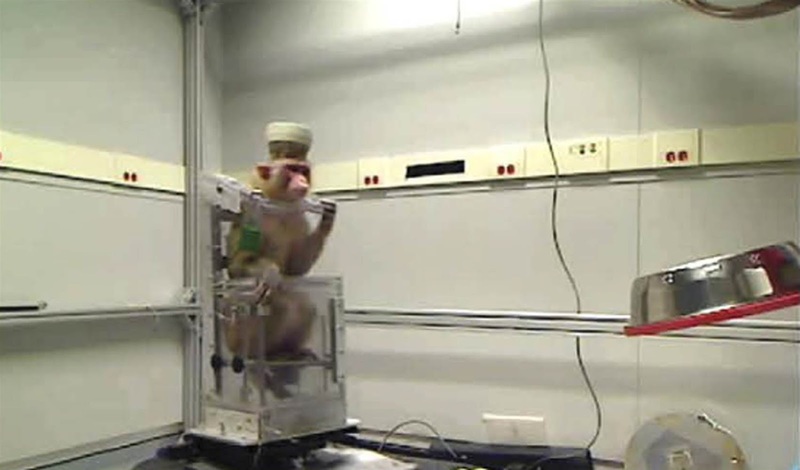 Although I disapprove of animals being used in lab experiments, this is an undeniably fascinating development. In this study, a monkey in an electronic wheelchair was able to navigate around a room, using an interface directly with its brain. This will eventually lead to mechanical means of movement that will allow paralyzed people to regain movement. It will also result in unforeseen consequences of developing a brain-computer interface. The lab of Dr. Miguel Nicolelis is also conducting experiments in rats to establish brain-to-brain sharing of sensory information, and also an interconnected "brain network". This work is amazing & somewhat frightening in its implications. 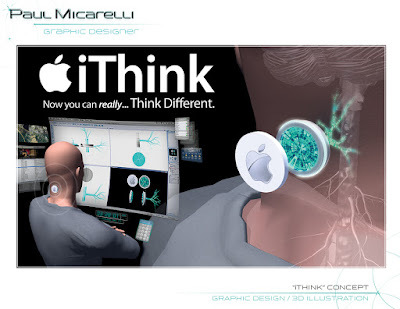 It is the groundwork for creating a technology similar to my concept for an "Apple iThink"- in which human minds are connected & augmented through electronic implants. This is another funny pic I made using the MSQRD app. The facial recognition software will also recognize 2D artwork, if it's in the form of a human face. I had some old Star Wars beginners books on my shelf, since I was planning on giving them to my nephew. So, I picked "The Lost City of the Jedi", since it had a big pic of Luke Skywalker's face. When I was doing the face swap, I realized how crazy my little face looked in there- so I made tried to look as weird as possible. Originally, I downloaded the app for the face-swapping feature, which can be hilarious. However, there are several other modes that are pretty cool & apply effects to your face in real time. 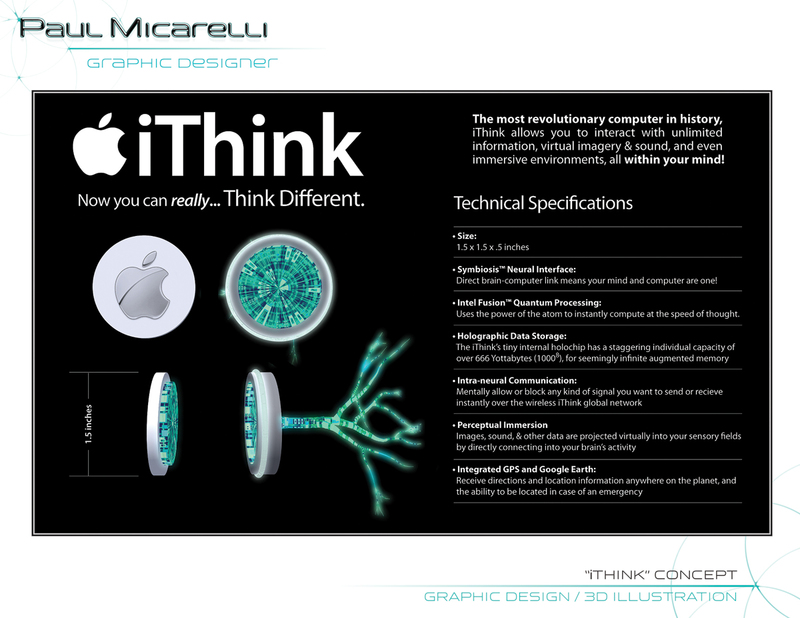 Even though the results are really entertaining, the technology behind it is still impressive. My girlfriend's parents buy all kinds of things at auctions & sell them on eBay. They always have interesting items circulating through their garage. Since I love novelty & seeing things I've never seen, I always ask them to show me their newest finds. This catalog from the 1970's was sitting on their counter, so I started looking at it. I thoroughly enjoyed flipping through and seeing all the crazy designs & styles from the decade in which I was born. The fashion and artistic sense of that time was probably the most horrendous & ridiculous that humanity has ever experienced. This Playskool McDonald's Toy Playset was one of the very few toys my grandmother had at her house. She kept it in a cylindrical wicker storage bin, in the corner of her living room with some cars & other random things. Finally, I took this to post the monkey masks in the "Planet of the Apes" set. It's basically a page of realistic toy guns, every kid's dream arsenal. 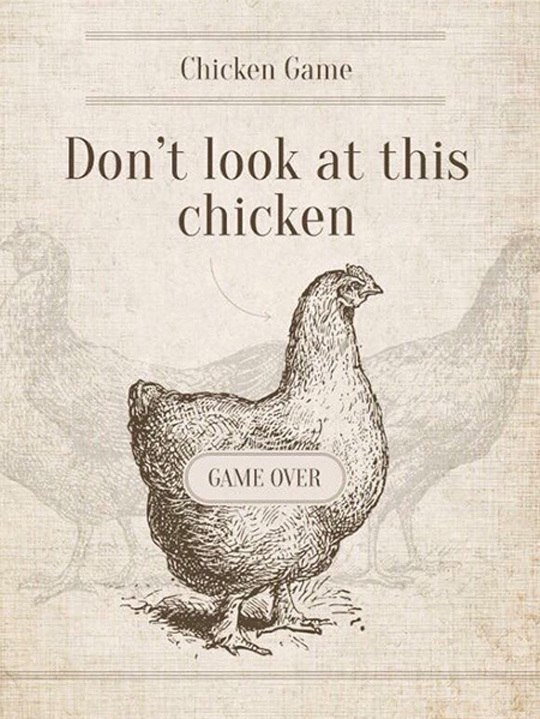 I saw this game that you're about to lose on The Weird Wide Web. On Reddit I saw this looped GIF of a beating heart outside the body. It is being kept alive while in transit to a heart transplant surgery. To watch such an inexplicably amazing phenomenon on a loop like this can almost take on a meditative quality. It's no wonder the psychotic elites running the ancient cultures who practiced human sacrifice were so focused on the heart. It is the pulsing source of the mysterious life energy that animates us all. I have posted before about the discovery that ancient Greek statues were actually painted in bright, bold colors. It is also known that the ancient Egyptians also painted their stone carvings & hieroglyphs in bright colors. 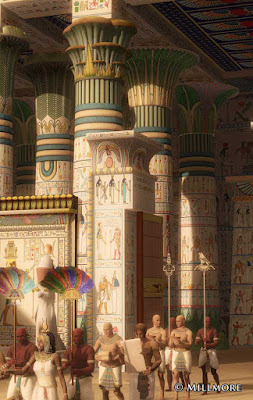 This is evident in the indoor temple and tomb walls that have been shielded from the elements. However, much of the Egyptian outdoor sculpture and architecture has been stripped of their paint, by centuries of harsh weather and the Nile's flood waters. Therefore, the temple exteriors appear a neutral color of the underlying sandstone. 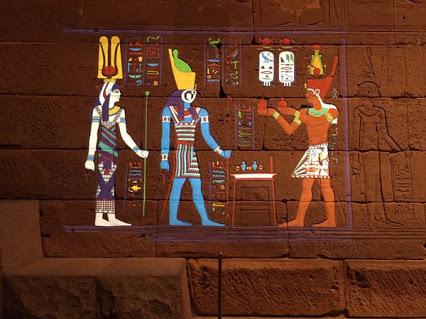 The Metropolitan Museum of Art has used digital projection technology to simulate the colors of the original whitewashed temple walls.